St. Paul’s Church in Jakarta, Indonesia. About 90 percent of Indonesia’s 260 million people are identified as Muslim, but the country has a small, influential Christian population. 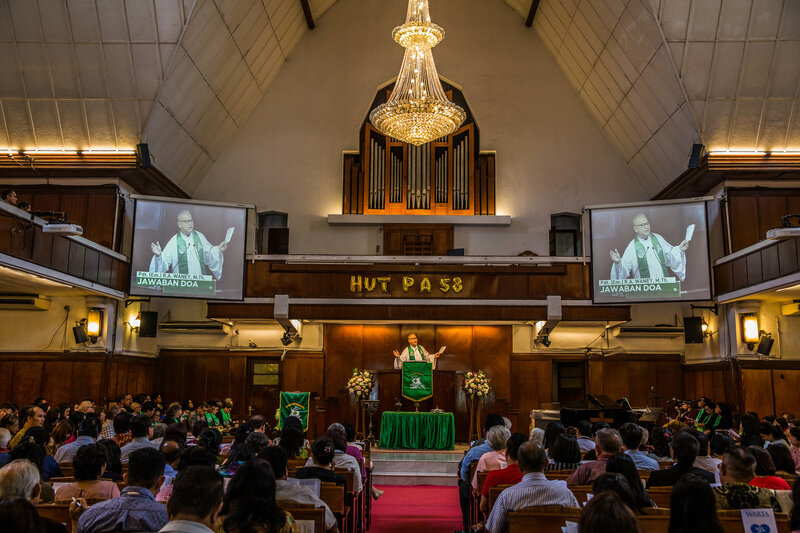 JAKARTA, Indonesia — On a tree-lined side street in the Indonesian capital sits a colonial-era Protestant church with rustic wooden pews and stained-glass windows, and an antique pipe organ built into a large wall behind the altar. Across the street is a modern, 100,000-square-foot mosque with towering arches at its entrances and a cavernous prayer area laid wall-to-wall with red carpet. Despite their different faiths, the two houses of worship are friendly, helpful neighbors — and an example of pluralism in the world’s most populous Muslim-majority nation at a time of heightened fears over religious intolerance. For the two houses of worship, normal means sharing parking spaces during busier services: Friday Prayer for the mosque, Sunday service for the church. They also host interfaith dialogue sessions, and even volleyball tournaments. 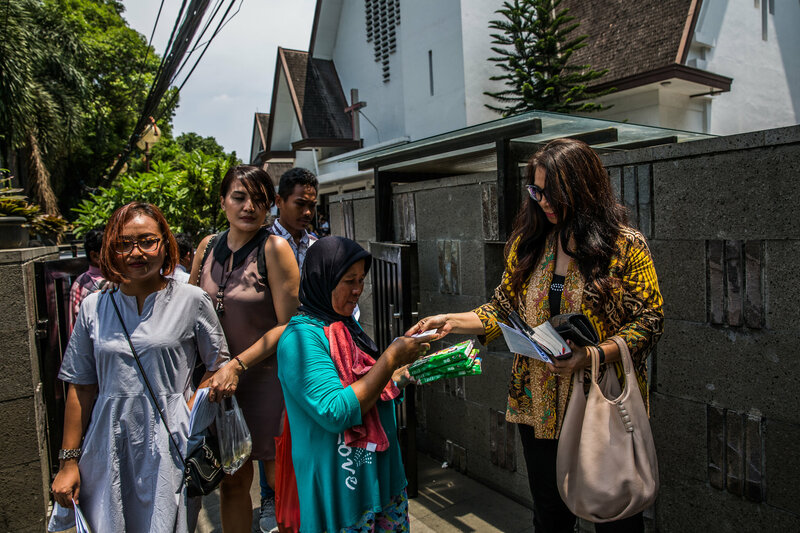 During Ramadan, the Muslim holy fasting month, the staff at St. Paul’s, some of whom are Muslim, carry boxes of food to the mosque for worshipers there to break their fast. This type of religious harmony among neighboring houses of worship is evident not just in Jakarta, but across the Indonesian archipelago. About 90 percent of Indonesia’s 260 million people are identified as Muslim, but the country also has small but influential Christian, Hindu, Buddhist and Confucian populations. Yet these friendly relations are regularly overshadowed by international news reports and social media posts about racial intolerance and fears of the “Islamization” of Indonesia. In recent years, there have been hundreds of cases of hard-line Islamic groups harassing, attacking and in some cases even killing religious minorities including Christians, Shiite Muslims and members of the Ahmadiyah Islamic sect, and forcibly closing hundreds of churches and other houses of worship across the country. 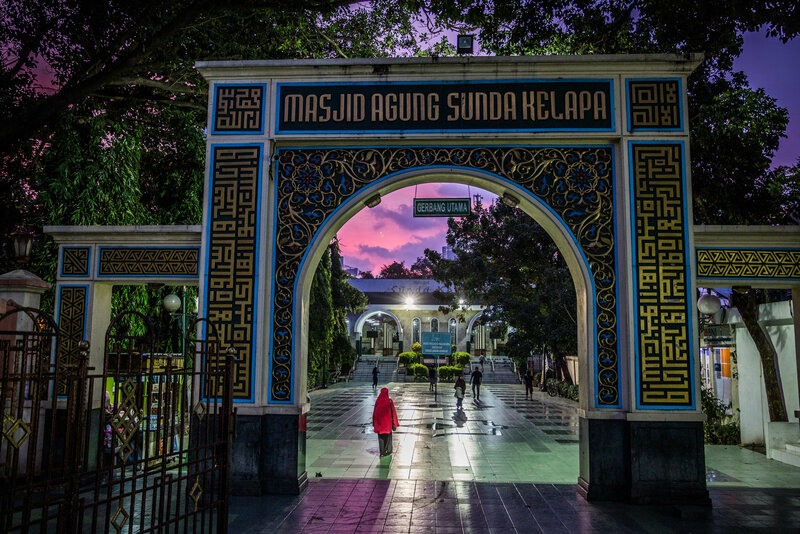 Outside the Sunda Kelapa Grand Mosque in Jakarta. The mosque and the church coordinate to share parking spaces during their busiest services. Then there is Indonesia’s domestic terrorism, dating back to 2000, including multiple bombings and attacks in Jakarta and the resort island of Bali by terrorist cells that pledged loyalty to Al Qaeda or the Islamic State. “If you see the actions of these hard-line groups, and threats from ISIS, or Indonesian militants coming back from Syria, they are a threat to interfaith cooperation in Indonesia,” said Theophilus Bela, former president of the Jakarta Christian Communication Forum, who has for years documented attacks on, and discriminatory actions against, churches in Indonesia. 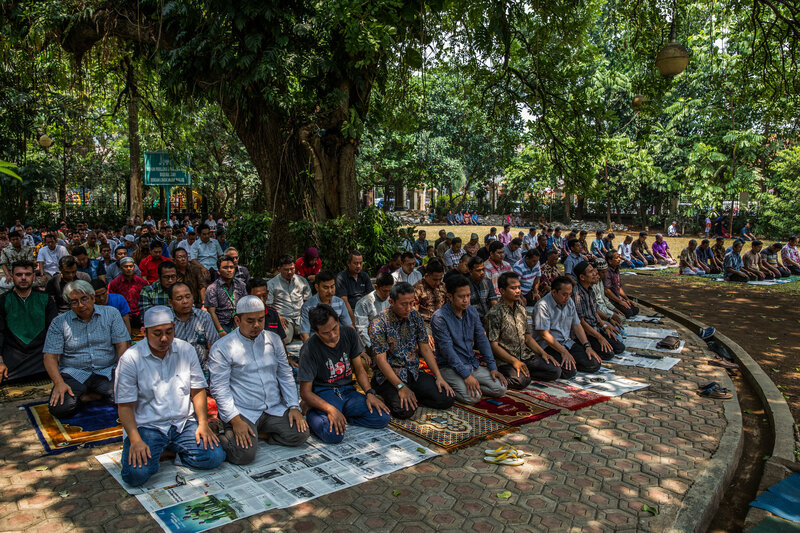 A recent local challenge to religious harmony can be found cater-cornered from St. Paul’s Church and the Sunda Kelapa Grand Mosque, where, across a boulevard and public park, lies the official residence of the governor of Jakarta. Basuki Tjahaja Purnama was supposed to be living there. Instead, he is in prison, serving a two-year sentence for blaspheming Islam in a case that ignited violent street marches through Jakarta by hard-line Islamist groups. They demanded he be prosecuted or lynched outright for citing a verse of the Quran that warns Muslims against taking Christians and Jews as allies. Mr. Basuki, a Christian, subsequently suffered a landslide loss in a runoff election in April. A few weeks later, he was convicted by a Jakarta court and immediately transferred to a high-security prison, to the cheers and celebrations of hard-line Islamic groups gathered outside the courthouse. Mr. Basuki’s prosecution and imprisonment shocked much of the country, in particular its religious minority communities. Despite the case and its stoking of Muslim-Christian tensions, both Mr. Nur and Mr. Pitoy contend that the episode of Mr. Basuki was more political than religious, and they say they are not worried about the long-term durability of Indonesia’s pluralistic tradition. In August, Christian Solidarity Worldwide, a human rights organization founded in Britain, released a report saying that Indonesia’s centuries-old tradition of religious pluralism was “under severe threat,” and that its reputation as a moderate, democratic Muslim-majority nation that protects freedom of religion was being undermined. The report said some Christian communities particularly feared for their safety. “There’s almost a sense that they are second-class citizens in their own country,” said Benedict Rogers, the organization’s East Asia team leader. In response to the fall of Mr. Basuki, who used to attend St. Paul’s, Indonesia’s president, Joko Widodo, one of his key political allies, established a special task force to reinforce the country’s state ideology, known as Pancasila, which enshrines pluralism. Despite Mr. Basuki’s case, violent attacks on religious minorities have decreased substantially in the past five years. The Setara Institute for Democracy and Peace, a nongovernmental organization in Jakarta, had recorded only 93 such attacks this year through August, compared with 264 in all of 2012. “But the number of blasphemy cases because of social media, because people have comments on Facebook and groups report them to the police, that is growing now,” said Bonar Tigor Naipospos, vice chairman of the Setara Institute’s executive board. Mr. Nur and Mr. Pitoy both said Indonesia’s core problem with religion is not intolerance, but a lack of education and understanding among its people. Less than half of all Indonesians have completed primary school, according to the government’s statistical bureau. » What is the difference between Ahmadi Muslims and other Muslims?